Recommended to: Readers who love to reads that are a bit creepy and a whole lot of fun! 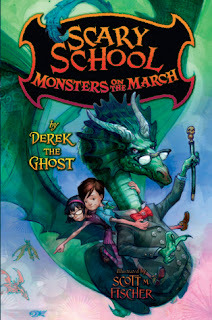 Last year I raved over the first book in the Scary School series. It took me back to my days as a young reader, visiting Wayside School and giggling up a storm at the zany antics of the characters. Needless to say, Monsters on the March had a lot to live up to! I was looking forward to more adventures with my favorite students, and definitely looking forward to a wacky read. Luckily this second installment far surpassed what I was hoping for. I couldn't get enough! 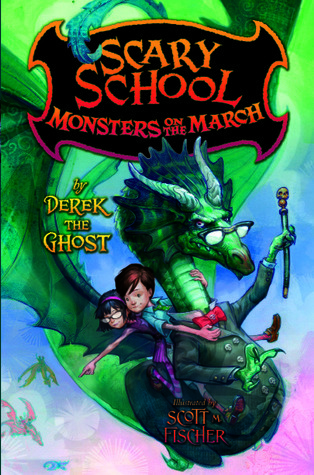 Derek the Ghost, our lovable ghost writer, quickly draws the reader right back into day to day life at the scariest school on Earth. If you haven't had a chance to read the first book, never fear! Derek introduces us to the cast of characters once again so, even if you're starting here, you won't be lost. This time the kids face a new adversary, the Monster King. Scary on the outside, but surprisingly pleasant smelling, the Monster King is all about manners. Step out of line? You might be a monster snack. So you can imagine his disbelief when Charles Nukid dares to save his daughter from her pirate fiance! The battle for Scary School is on. This book is perfect for reluctant readers and, in my opinion, easily transcends both age group and gender. No matter whose hands you put this book into, they're bound to love it. The illustrations are wonderful, the writing is perfection, and the plot twists are sure to delight. I'm a fan, tried and true! Add this book to your reading list and join me in the fun!